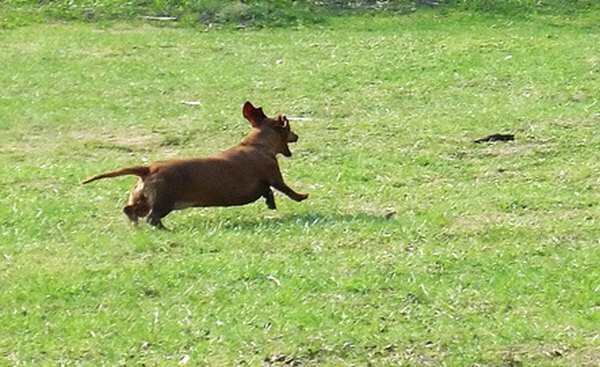 Dachshunds love running, chasing and barking. Bred to hunt badgers from their burrows, dachshunds are active and alert dogs with a tendency to bark. The deep, loud bark of a sausage dog can sound like it's coming from a much larger hound, which makes the dachsie an excellent guard dog. However, excessive barking should be stopped. Set the scene for your home environment to be calm and restful for your dachsie. Commonly, wiener dogs are prone to separation anxiety -- they may bark to express frustration or anxiety at being left alone. Maintain a steady routine for your dog, so each day he knows roughly when he can expect to wake up, be fed, go for a walk and hang out with you. If your work schedule is irregular, consider using a dog-walking or pet-sitting service to maintain your dog's routine. Exercise your dachshund regularly, so the dog is tired at the end of each day. 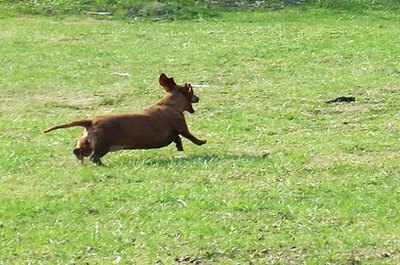 Dachsies like to spend about 30 minutes walking each day -- this can be one long walk or two shorter sessions. Backyard playtime, or running around inside your home, all counts as exercise. Provide plenty of interesting dog toys for your dachsie to enjoy. Barking may be a sign of boredom and can be relieved by having new and favorite toys to hand. Discourage your wiener dog from barking excessively -- squirt him with a spray bottle or small water pistol as soon as he starts barking inappropriately. Tell him "no!" or "quiet!" or another firm command. Do not soothe, pick up or otherwise pay positive attention to your dog while he is barking, as this reinforces the behavior. Give your dog treats or enthusiastic praise when he pays attention to your command and stops his barking behavior. While the dog is not barking, tell him how pleased you are and give physical rewards such as tickling or playtime. Stop praise and rewards the moment your dachsie starts barking again. This way, he will have positive associations with being quiet, and negative associations with barking. Dachshunds are characteristically eager to please their owners, so consistently rewarding non-barking should eliminate excessive barking behavior. A barking dog can be extremely frustrating, but you must never hit, strike or neglect your dog as punishment for barking.